Yeh Rishta Real Truth Revealed Goenkas organize the baby’s naming ceremony at Singhania House only for Kirti’s sake. 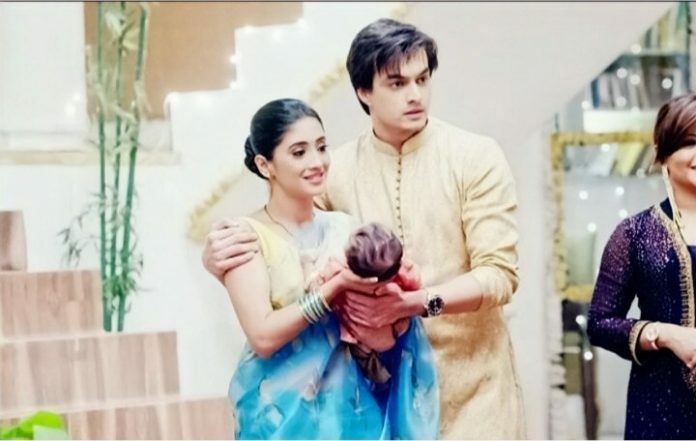 Kartik wonders that Naira’s wish to conduct the Naamkaran in Singhania house is again something destined, since the baby belongs to Singhanias in reality. He doesn’t stop Naira’s wish since its the baby’s right as well to get the baby to his real home. When Naira tells him that actually a Bua names the baby, but the ritual couldn’t be completed because of Kirti’s state, Kartik feels that the ritual has already for completed, since Naira is baby’s Bua factually and she has named the baby. He feels though the lie is complicated, but Krishna is making the baby achieve everything by following the traditions. He regards the baby lucky for everyone. He prays that Naira’s words get true and baby brings Kirti out of coma state. 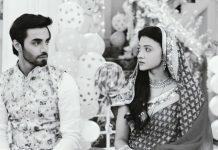 Kartik and Naira throw a lavish party at Singhania house and invite many people. They make the baby ready and bring him downstairs. Everyone gets glad, while Dadi tries to keep the baby away from the bad sight of people. Everyone asks them what name did they decide for baby. The family members laugh along and suggest strange names for the baby. Kartik is thinking of the truth which he has hidden from everyone. He recalls Kirti’s words. Naksh and Kirti have already decided the baby’s names. Kartik keeps their wish as well and tells Naira that they should name the boy Krish. Naksh realizes that Kartik has fulfilled Kirti’s wish and Naira has too kept this choice of name. He thanks them for giving much respect to Kirti’s wish. Kartik lets Naira name the baby and announces the name to everyone. Everyone blesses the baby and are happy for his name. Naira takes the baby to Kirti and tries to make her connect. Kirti makes some movements, which go unnoticed by Kartik and Naira. They take the baby and leave out. Kirti feels the sensation by the baby’s touch. Kirti will recover soon. Everyone is happy for baby’s Naamkaran. The baby’s truth will be soon out. The nurse will be seen involved with Aditya, who has planned the baby swapping before Kartik. The shocking twist will change the meaning of relationships in Goenka and Singhania house. Aditya doesn’t regret his punishment, when caught in the accident case. He feels he has played the master stroke and ruined Kaira and Keesh’s lives already. Mannat goes lost in Shivaansh’s love. She thinks of him and imagines a romantic moment. She makes a mistake again and angers him. She carries out the arrangements of Shivani’s marriage. She gets dreaming about her romantic hero Shivaansh. She wishes if she could become his dreamgirl. Shivaansh’s presence makes her happy. She drops the fevicol on the clothes. She leaves the decorations and spoils everything. Shivaansh gets another chance to yell at her. He asks her why is she standing here like a statue and staring at him. She tells him that she just stared at him as he comes in front of her. He sits over the clothes which has fevicol on it. The cloth sits to Shivaansh. Everyone laughs on Shivaansh for his long tail. Mannat tries to stop Shivaansh, but he doesn’t listen to her. He asks her to stay away from him. He goes away with the long clothed tail calling himself perfect. Nani finds Mannat the right girl for Shivaansh. She waits for the moment when Shivaansh falls in love with Mannat. Rohan learns Sudha’s truth. He decides to leave the house. Karan gets upset with Rohan. He wants to support Sudha. He asks Rohan to just value their mother. Rohan tells Sudha that this crime can’t be forgiven. Rohan asks her how could she risk his future by her plans. Sudha tells him that she won’t go leaving him. Rohan tells Karan about Sudha’s evil plans, that’s the reason for his hatred for Sudha. He asks Karan to open his eyes and not be blind in Sudha’s love. Karan acts in front of Rohan and shouts on Sudha. Sudha tells him that she has done this to get her sons back. Karan tells her that he has also lost her trust on her. He asks her to think of the dire consequences. Rohan surrenders to police to save Raman. Raman gets freed from the jail. He gets confused over Rohan’s big move. Ishita tells Raman that Rohan has really reformed. She asks Raman to forgive Rohan, since he is just taking the punishment on himself to save his mum. Ishita takes Raman home.